It’s easy to say that Tim Burton has lost his touch, but I’m not sure that’s entirely true. Sure, the director has certainly floundered lately with outings like Alice in Wonderland and Dark Shadows disappointing both critics and audiences, but there is still a dedicated fan-base out there that is willing to forgive him for his latest mistakes, whilst at all times harping on his earlier films like Edward Scissorhands, Batman, Sweeney Todd et al. Like some people, I find him to be a very hit-and-miss filmmaker, one that has undeniable visual imagination but an aloof sense of character and human emotion that seem a little alien; that’s probably part of the charm for the majority of his fans, but for me it’s often been distracting enough to not entirely 100% enjoy his stuff. So, when a project comes along that seems tailor-made for someone like Burton, like Miss Peregrine’s Home for Peculiar Children (based on Ransom Riggs’ novel of the same name), I usually take it with a pinch of salt, knowing that no matter what I end up thinking of it, at least there will be a dedicated audience for it all the same. That is pretty much exactly what I got: a film which I didn’t entirely enjoy, but one that most if not all Burton loyalists probably will. The story is about a teenager in modern-day Florida named Jacob (Asa Butterfield), who after the mysterious death of his grandfather (Terence Stamp) travels to a remote island in Wales to seek out a former children’s home that was destroyed in the Second World War. 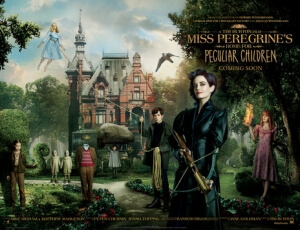 There, he meets a group of children with extraordinary abilities, including floating in mid-air to being completely invisible, who take Jacob via a time loop back to 1943 to meet Miss Peregrine (Eva Green), their headmistress, and learn about the dangerous creatures known as Wights and Hollows that feed off of the eyes of “peculiar” children. From there, it’s a journey to protect the children and stop the monsters at all costs, and honestly if I went into any more details, my brain would fry from just how complicated it actually gets. As ever with a Tim Burton film, the visual style is spot-on. The costumes, sets, and Bruno Delbonnel’s cinematography all work to give off a comfortably gothic and strange vibe, all while just refraining from becoming self-parody. The vibrant colour scheme also makes it a pleasant film to look at; when it needs to be nice and sunny when visiting the children’s home, it will look exactly that, and ditto for the overcast and gloomy atmosphere of the present-day Welsh island the main character visits. There is also a brief but fun mini-sequence that involves stop-motion animation, a welcome throwback in today’s CG-dominated environment, which begs the question why, when the effects do inevitably take a more computer-generated turn, Burton didn’t just stick to his guns and make the other effects like that one? Either way, it was nice to see a film made nowadays that did incorporate that old-school effect, no matter how brief, into a modern studio blockbuster. However, while the style is unmistakably Burton’s, that’s also part of the problem. Miss Peregrine’s Home for Peculiar Children mostly just comes off as an exercise of how much of Tim Burton’s quirky and off-kilter style can actually fit into a movie, instead of actually being a movie. The script, written by Jane Goldman, doesn’t explore the setting or even any of the characters enough to make them interesting or give them personalities outside of their peculiarities, and the plot can get so convoluted that it’s hard to follow at times, meaning that it’s not entirely possible to become invested or even care about what’s going on. Instead, Burton’s style seems to dominate all throughout, and while it’s not a bad style to watch for a couple of hours, it can’t be the only thing you take away from a movie like this. You need character, you need a linear plot, and most of all you need to actually care about what’s going on, and I felt this movie just didn’t have any of that. As a result, I actually ended up feeling rather bored throughout a lot of it; I wasn’t really invested in this main kid, despite Butterfield’s obvious talent, and the kids with all these fascinating abilities – who SHOULD be the main focus instead of this milquetoast character – are side-lined and majorly undeveloped, as though they’re supporting characters in a film where they should be the leads. Even Eva Green, who in the past has excelled in completely bonkers roles like in 300: Rise of an Empire, Penny Dreadful, and even Burton’s own Dark Shadows, is relegated to an almost nothing role, there to spout endless exposition instead of developing a fun personality. It’s hinted at, sure, but it could have used a whole lot more of it. At least Samuel L. Jackson, as the main villain, looks like he’s having a good time, with a Doc Brown hairstyle and delightfully creepy white contact lenses making him a reasonably fun baddie to watch, even though it soon becomes apparent that he’s about as much a threat as the aliens from Signs. But it is very much a Tim Burton film, and if that’s what you’re looking for then that’s what you’ll get with this film. For me, this is the kind of style-over-substance film that Burton excels at, where the style can be pretty enough to mostly overlook its gaping script problems and lack of actual investment, but only up to a certain point. Miss Peregrine’s Home for Peculiar Children is a pretty but hollow style-over-substance movie that puts director Tim Burton’s unique directorial vision front and centre, and while it’s a pleasant style to look at it can’t quite mask its more obvious problems, mostly with its convoluted script and underdeveloped characters.